This post is from 5 years ago, July, 2013. I believe we’re all still thinking about and struggling with these same issues today! Games that are not games. 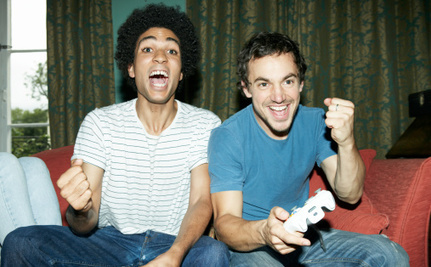 There is a serious barrier to the effective gamification of mental health. This barrier is that the games we psychologists and health professionals are coming up with are not fun. In fact, they are totally uncool, border on the condescending, and wouldn’t motivate anyone to play for more than 30 seconds. This is the case even though the bar is set quite low because these “games” address things that people really want, like boosting our intelligence and memory, reducing depression and stress, quitting smoking, … fill in the blank. I’ve been fascinated with this disconnect between Psychology’s view and real-world acceptability. 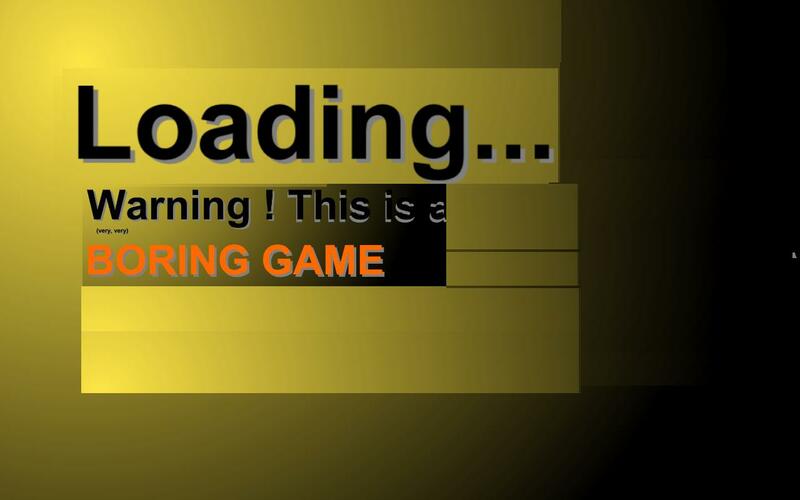 This disconnect is plaguing other fields as well, such as in the development of “serious games” for education. In this larger context, I’ve been working on the development of an app that takes a scientifically proven approach to reducing stress and anxiety, and embeds the “active ingredient” of this intervention into a game that is fun – fun enough, we hope, for someone to want to play for much more than 30 seconds. Fun versus health goals. In the midst of this ongoing development process, I had the pleasure of speaking with Nick Fortugno, co-founder of the game design company Playmatics. In addition to creating really fun games, like Diner Dash, he has created games to promote positive social change and is one of the visionary and forward-thinking advocates for the idea that serious games can and should be fun. So, he has a deep understanding of the barriers facing the gamification of mental health. As we were talking about these barriers, Nick said something that really got me thinking. He said, when we design games for education or health, we have to remember that “the game doesn’t care” about whether we’re making progress towards our goal. In other words, a game isn’t fun because it meets some criterion that we, the developers, have for success – like boosting our ability to remember, reducing symptoms of anxiety, or losing 5 pounds. A game is fun because it creates an aesthetic experience and facilitates game play that we want to come back to again and again. Therefore, I would argue that a “serious” goal embedded in a truly fun game is reached as a by-product of the fun. The need for backward engineering. I think I am accurate in saying that very few people, myself included, who are trying to create serious games for wellness think like this – i.e., like a game designer – about the process of gamification. From what I can tell, game designers think very deeply about the experience they want the game to promote, and then they work through the pragmatics of the game play that will facilitate this experience. This backward engineering from the point of view of the aesthetic/experiential goal to the pragmatics of the game is the opposite of what psychologists do when they think about gamification. Instead, we have parallel streams of development in which (a) we know that our “game” (read scientific protocol) is truly boring, and (b) we have to somehow decrease the snore factor. We think: “Hm, here is my very rigid experimental protocol/computerized intervention. I must overlay this protocol with some cute little animated guys, perhaps with a fun back-story (wizards? aliens?) and then make sure users get points when they conform to the requirements of the protocol.” Sounds thrilling, huh? So fun? Exactly the recipe for the next Dots? Right…. So, we have a lot to learn from game designers, and I believe that crucial to the future of the endeavor of gamifying mental health is partnering with people who know how to create fun and understand the process of game design. Pocket rituals. What would it be like if we created mental wellness tools, or even interventions for serious mental health problems, that were truly fun and that could become part of our array of habits and strategies for feeling better, reducing symptoms, performing more efficiently, or dealing with stress? These games, if “snackable” would become our pocket rituals, our chill pills. We could take out our device for 5, 10, or 15 minutes and be empowered to bring about a targeted, appreciable positive impact. The barriers to use should be minimal, the experience intrinsically rewarding – that is, it feels good to play – as well as reinforcing because it helps us meet our health goals. I think many psychologists feel that this approach is not easily conducive to a rigorous scientific approach. But if we fail to find a way to do this – good science and giving people tools they want to use – then the whole endeavor is dead in the water. Blast from The Past – Politics and the Culture of Fear: Is There a Place for Digital Disruption? It feels as if we can’t escape the culture of fear and extremism that is pervading politics. Political discourse is more vitriolic than ever after San Bernardino and Paris, and during the months of partisan name-calling and ugly mud-slinging among candidates for the U.S. Presidential Race. And clearly, there are no easy solutions to unraveling this vicious cycle. During the Christmas holiday, I had an experience that perfectly illustrated this to me. My family and I were at a friend’s house for a holiday event, and I overheard her guests talking as I walked through the kitchen. I heard, “The more he says, the more I like him.” Then, “He says the things we all think but are afraid to say.” I started to get that sick feeling in the pit of my stomach, hoping they weren’t talking about Donald Trump. Then I heard, “The only problem with building a wall between Mexico and the U.S. is that it will have to be so big that it’s impractical and expensive.” I tried to talk myself off the ledge, saying to myself, “Don’t open your mouth, just keep walking, don’t say anything, it won’t help or change anyone’s mind…..” But then as I was about to turn the corner, safely avoiding a conversation that would surely have turned ugly, I heard, “Of course we should ban Muslims from entering the country. Look what they did in Paris.” So, I turned sharply on my heel and unwisely marched over to the little group sitting around the kitchen table. I found this conversation terrifying – not only because the thought of Trump as President is terrifying, nor because I was disappointed in myself because I lost my cool, and created an extreme, unbridgeable divide between our viewpoints by invoking the Holocaust. No, this conversation was most terrifying because these people were not bad people. They were the type of people I appreciate: good, kind, hard-working people who love their kids and their family. I don’t have a solution, and indeed, my own extreme reaction during the kitchen table conversation shows that I lack objectivity and am certainly part of the problem. I do, however, as a scientist believe that we can harness what we know about our minds and brains to neutralize this vicious cycle of social and political extremism. Could digital disruption help move us along a path to such change? There might not be an app for that, but below I list three steps I believe could put us on the road towards digital disruption of the political culture of fear. 1. Frame political extremism as an emotion regulation problem. Before any digital disruption can happen, we have to make sense of the problem and have a concept of what’s going wrong. We have all had one of those kitchen table conversations I described above. In these conversations, our emotions get the better of us – fear, disgust, anger. This is a problem in how we control our emotions and how our emotions control our thoughts, decisions, and actions – something psychologists call emotion regulation. The problem is that our strong emotions rarely convince our debating partners. Instead, they solidify the views everyone already holds, causing us to cling to them even more strongly and rigidly. Common ground is lost, and the divide between perspectives seems increasingly unbridgeable. Imagine how a version of that kitchen table conversation happens on the political world stage, sabotaging attempts at diplomacy and mutual understanding. The result is not just upset and angry people. Now the result is that our emotions directly shape political discourse, legal decisions, and policies that can affect generations to come. Thus, a first crucial step towards disruption of the political culture of fear is to frame political discourse in terms of emotion regulation – applying what we know about what goes wrong and how to fix it on the individual and group level. 2. Use technology to promote empathy. Recent research in political psychology suggests that empathy can help heal rancorous political divides. A recently-published study showed that when political advocates fail to understand the values of those they wish to persuade, this “moral empathy gap” causes their arguments to fail. However, when political arguments are reframed in the moral terms of the other side, they are more effective. For example, when asked about their views on universal healthcare, conservatives who heard “purity arguments” (e.g., sick people are disgusting and therefore we need to reduce sickness) were friendlier towards universal healthcare, compared to when they heard “fairness arguments,” which are more consistent with liberal values. If we can use technology to bridge the moral empathy gap, we might be able to reduce political polarization and promote better emotion regulation, more compromise, and deepened understanding. Virtual Reality (VR) might be one such technology. I previously wrote about Chris Milk’s thought-provoking TED talk on VR as the “ultimate empathy machine.” By creating a sense of presence and of real interactions with people and worlds, VR forges empathic bridges leading to greater understanding and compassion. In his work with the UN, Chris Milk uses VR to vividly portray the plight of refugees to politicians and policy makers. How does seeing and experiencing the suffering of 5-year-old children in the refugee camps influence policy making? : Almost certainly for the better. In a paper I wrote in 2014 with Dave Amodio, a professor at NYU, we found that children of liberal compared to conservative parents showed a stronger “N2” brain response to mildly threatening and conflicting information. A greater N2, derived from EEG, suggests more openness to uncertainty, ambiguity, and threat. A culture of fear, in politics or otherwise, is marked by the opposite of this: inflexibility and discomfort in the face of uncertainty and ambiguity, along with resistance to change. These aspects of fear are part of the foundation upon which intolerance is built. What if we could create computerized interventions that promote our ability to cope with uncertainty and change – perhaps by strengthening the N2 response? 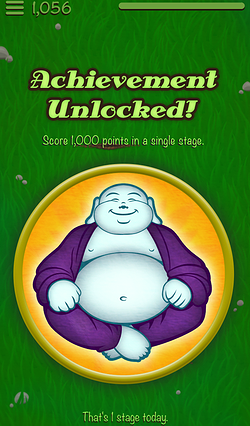 My research on the stress reduction app Personal Zen, as well as other research, shows that this may be possible. More research is needed, but if science-driven digital mental health continues to evolve, reducing the political culture of fear could soon be in the palm of our hand. I had a great time speaking with Lisa Garr about Personal Zen and the Digital Mental Health Revolution on the Aware Show. I want to break up with you. After all, you’re a cheat and a liar. But I’m not going to let you off that easily. Why? Call me foolish, call me naïve. But I have to believe that there is good in you yet and I’m going to stick with you, through better or worse. And now, it’s definitely worse. It’s been a couple of months since the truth came out – that you “deceived consumers with unfounded claims that Lumosity games can help users perform better at work and in school, and reduce or delay cognitive impairment associated with age and other serious health conditions.” Ouch. This from no less than the Federal Trade Commission. They saw through your deception and fined you millions for it. I wish I could say I saw this coming, but my feelings blinded me. And I did come to you with many strong and deeply-felt emotions but you decided to prey upon my fears – of not performing at my peak, of growing old, of my brain not working as quickly or well as it used to, even of developing serious health issues like Alzheimer’s disease. I was at a vulnerable point and was desperate to believe in you and your overblown claims. Looking back, it’s hard to imagine that I fell for it, actually thought that you could help me turn back the clock. But it felt so good to play your little games, to believe that I could change for the better. You seduced me. The Standard Center for Longevity saw the warning signs back in 2014 – they issued a Consensus Statement on the brain training industry from the scientific community, stating that the industry lacks any compelling scientific evidence that their products will reverse cognitive slowing and forgetfulness, improve everyday functioning, or help to prevent dementia. But I ignored the red flags, believing that, for me at least, you would be different. Can anyone ever really change? I have to believe it’s possible because, despite the betrayal, I believe you could be so much more than you are, Lumosity. And I think there are concrete steps you could take on the road to redemption. First, get some real scientific validation. It’s possible you don’t know this, although it seems like you have a bazillion scientists working for you, but saying something is science-based SHOULD MEAN that you and other independent scientists have conducted rigorous scientific studies on your own brain training games and show with A HIGH DEGREE OF CERTAINTY that your actual products generalize to real life – that means, remembering where I left my car keys, performing better at work or school (not just on your computer games), or showing actual biological signs that the ol’ brain is working better. With all your money and all your testimonials (solicited through contests that promised prizes), you don’t have a bit of data that the FTC considered compelling. You need to turn this around. Second, consider an open relationship. Lumosity, let’s see other people. You’re not meant to be in a monogamous relationship. Even with scientific evidence, why would you ever think you could make a person smarter, happier, and healthier, all on your own? You do best when you’re a really good friend – dare I say a fling? – to a person already in a committed relationship. Take for example my relationship with exercise. The single best “treatment” for physical and mental deterioration is physical activity. I’d like to focus on this relationship, and others probably should, too. Why don’t you just offer to help out on the side, give us something fun and engaging to do in our down time. You’re supposed to be a tool – and I don’t mean that kind of tool. I mean a tool that we can use when we need it, to complement the other tools we use to live well. Third, stick to what you’re good at. You’re good at creating brief and engaging games, but you’re also really good at generating interesting data and connecting people since you’re digital. Focus more on mining that data to create more effective products, and better yet, foster the creation of communities that help people make all-around healthier choices. Instead you’ve been focusing on creating co-dependent relationships. Someone has to break it to you, so it might as well be me – screen time can only take you so far. You and other kinds of health technology need to rethink your approach. Stop taking our time, distracting us and instead get out of the way and help people spend their time well and in healthy ways. My friend Time Well Spent has been talking to me about that, and has really helped me think through my relationship with you. So, Lumosity, I’m giving you a second chance. I know people often say – it’s not you, it’s me. Well, this time, it’s definitely you. I hope you will rise to the challenge. Politics and the Culture of Fear: Is There a Place for Digital Disruption? 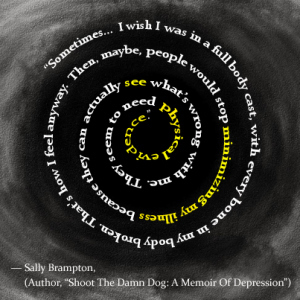 A wonderful and courageously honest blog post from Shira Renee Thomas on the experience and stigma of clinical Depression. The personal (and economic) burden of psychological disorders is profound, and greater than that of any other type of disease – including diabetes, cancer, and cardiovascular illnesses! Over 350 million people worldwide suffer from Depression. Yet, we’re only now waking up to the importance of thinking of Depression and other psychological diseases as a public health crisis that requires much, much more awareness and many more resources to reduce stigma and help alleviate individual suffering. When I talk to people about the digital health space – specifically digital mental health – I often say, “It’s the Wild West!” and everyone nods. But then I stopped to think about what I really mean by the Wild West. I realize that the metaphor holds up very well. There is a gold rush. The California Gold Rush began on January 24, 1848. News of the gold brought some 300,000 people to California from around the world. They were called forty-niners in reference to the year the fever really hit, 1949. Tens of billions of today’s dollars in gold was recovered. 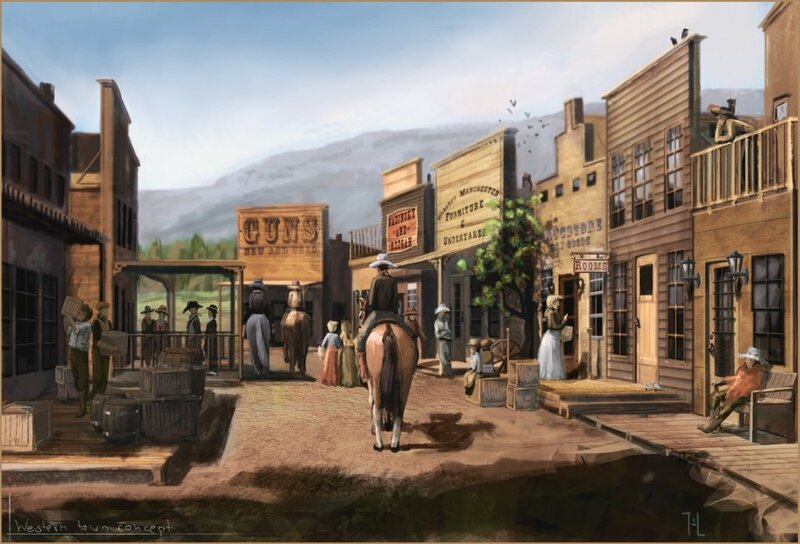 The gold rush transformed the economy of California and economies all over the world. The financial opportunity – and temptation – represented by the digital mental health revolution is similarly profound. Americans alone spend over $148 billion annually on mental and emotional health. Moreover, more than half of people suffering from emotional and mental distress will never seek treatment – meaning there is a huge, unmet need. Of these who don’t seek treatment, over 45% cite price as a barrier, and over 40% cite stigma as a barrier. Digital health tools, like mental health apps, address these barriers by being highly accessible and highly affordable. They also have the potential to neutralize stigma because, as I’ve argued before, mobile devices are the hub of our lives and thus what we do on them automatically gains an aura of “good.” Digital health therefore represents a perfect marriage between social good and economic potential, and there are plenty of forty-niners who see this opportunity and want to cash in. There are snake oil salesmen. Indeed, many companies are jumping on the wagon and digging for digital health gold (to keep the Wild West metaphor going). Some of these companies offer great, beneficial products, but others are “snake oil salesman.” Snake oil is an old-fashioned term that tends to refer to fraudulent health products or unproven medicine, but in general refers to any product of questionable quality. A snake oil salesman is someone who knowingly sells these fraudulent products. You see these guys as comic relief in Western movies all the time, usually a traveling “doctor” selling fake medicines, who leaves town before customers realize they have been cheated. One way for us to get around the risk of snake oil is to elevate the dialog around digital health and develop ways of evaluating the scientific quality of what’s out there, since none of this is regulated (yet). This will help us look past the shiny bottles of alluring medicines that are actually snake oil, and find the real healing agents. Psyberguide is one organization I came across that appears to be trying to do just that. If we don’t push ourselves as an industry to meet standards, we risk becoming comic relief rather than a true paradigm shift. We also risk repeating the failures of the analog healthcare system, just making them digital. There are pioneers. I believe that a science-backed digital health revolution will be the single most important paradigm shift in the failing mental health industry. This revolution will allow people to promote their personal wellness like they do their physical wellness and fitness. It will allow people to access treatments that are effective without being too expensive, burdensome, or stigmatizing. We need to think outside of the box for a true paradigm shift to occur in how people access support for their emotional and mental health – whether that’s the transformation of how patients access their health information through electronic medical records, how health information is collated to lead to better diagnosis and treatment, how health information is gathered through tests done on mobile devices, or how interventions are accessed, through mobile health apps and digital brain training. Pioneers in digital health are rethinking how to empower the individual to promote their own mental and emotional wellness, to use personal health information to actually improve our lives, not just be monetized by big companies mining our big data. I firmly believe that destigmatizing mental illness and emotional distress will be the linchpin in this paradigm shift. Mental health – when we say those words, we think illness, not health. We think of people being crazy, despondent. Why is that? It is because Psychology and Psychiatry have failed to make mental health a positive goal like physical health and fitness. When we struggle emotionally, we feel broken. Treatments are burdensome, hard to access, and stigmatizing. We need to be on the vanguard of a paradigm shift away from stigmatizing, expensive treatments emerging from the “if we build it they will come” mentality, and towards a new vision in which people are empowered to personalize their mental wellness through tools that work for them, when and where they want them. If pioneers brave the Wild West that is the digital health field of 2015, we have a chance of creating something that transcends our humble beginnings to actually make a difference. A great essay from the Wall Street Journal on the promise and challenges of the smartphone revolution in healthcare – from mobile physical exams, to merging day-to-day health data from wearables with medical records. 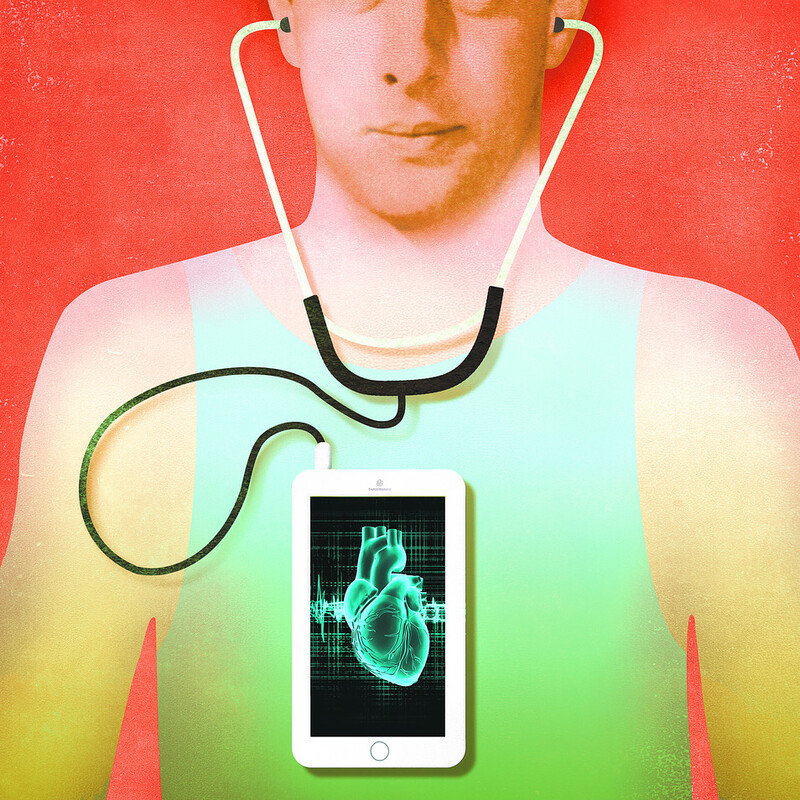 A key – and underdeveloped – innovation here will be to integrate health tracking with mobile therapies. This transformation of healthcare – both physical and mental – is going to happen, and it is up to us, as patients and professionals, to make sure that it is done right, with the privacy and well-being of the individual as top priorities. I’ve been interested in some emerging companies, like Mana Health, that are on the cutting edge of this revolution because they are solving the problem of how to effectively merge clinical data with health data collected in the daily lives of patients, and directly empowering patients to have a clear voice in their healthcare and greater collaboration with doctors.